Kittens are adorable. It’s difficult to resist these funny, lively little bundles of fur and energy. But when you adopt a kitten, you get a baby who needs a lot of time and attention from you. You must teach a kitten how to be a good companion. Kittens have sharp little teeth and claws.Unfortunately they can’t differentiate between climbing the lovely cat tree you bought for them and climbing the drapes, couch, or your leg. And kitten teeth might miss the toy you’re playing with and chomp down on your hand. These tiny balls of energy are not the best choice for families with young kids or older people who are not steady on their feet. Kittens are fragile and can get hurt by children who don’t know what “gentle” means.And they tend to magically appear underfoot, causing a person to trip or fall trying to avoid them. No question you’ll need to kitten-proof your home. 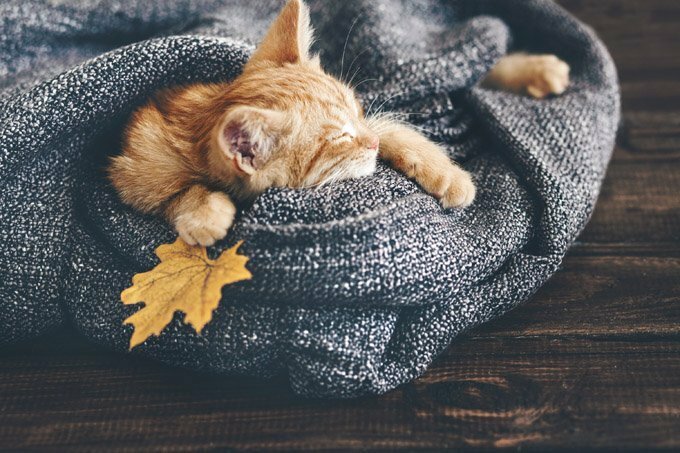 Think like a kitten and view your house from his level, removing all the objects that could cause him harm.You’ll want to consider everything, fromcovering electrical cords to making sure there aren’t any dangerous items on the floor to hiding valuables that might be broken. Even with their drawbacks, kittens will bring you hours of amusement. When you adopt an adult cat, you know exactly what you are getting. You know what they look like, their body type, and coat. You can tell whether the cat is laid-back or active, vocal or quiet, cuddly, curious or shy. If you work outside your home, and the cat will be alone all day, an adult cat is a better choice. Kittens on their own tend to be lonely and can get into trouble while looking for amusement. Older cats sleep more and are satisfied entertaining themselves. Another reason to adopt an older cat is the joy you get by giving him a second chance. People go to a shelter or rescue to look for a cat but the CKF (Cute Kitten Factor) often keeps them from seeing all the sensational adult cats. Don’t forget to check out the adults who already know their manners. You might be pleasantly surprised. Regardless whether you adopt a kitten or an adult cat, you are going to be doing a good deed. The shelters are full of both cats and kittens in need of loving homes. We have our own CatTime.com adoption section full of beautiful cats and kittens who would love to move in with you.